Easy advice …but you got to buy the ticket to win the Lottery! Vincent Van Gogh is a vivid example of the quintessential painter- talented, tormented, struggling with his work and unappreciated in his time. Even when he was most confident about the value of his art as Art, Van Gogh had little faith in his appeal to a larger audience. He felt his paintings would be appreciated by those urban people who “retain unfading impressions of the country, and remain all their lives homesick for the fields and peasants.” As he said “…what I do is not saleable … but it can be sold to people who buy things because there is nature in them.” Elsewhere, he complained about the tight-fistedness of ordinary art lovers and that he would have to work cheaply for a wider audience. Very ironic indeed for a painter whose Irises sold for £ 27 million in 1987 and whose work enjoys universal recognition and appreciation. The story of Vincent Van Gogh is the most well known, but in different ways; the story is retold whenever we talk of successful painters and their path to fame. M.F. Husain, our famous barefoot painter and his beginning as a painter of film posters is a case in point. Even India’s premier, abstract painter Jehangir Sabavala, recalls his days of struggle and is amazed that art prices have risen beyond recognition. While we feel for their pain, what the investor in Art would really like is to meet up with his or her own Vincent Van Gogh – undervalued when it comes to buying but with the potential to sell big. 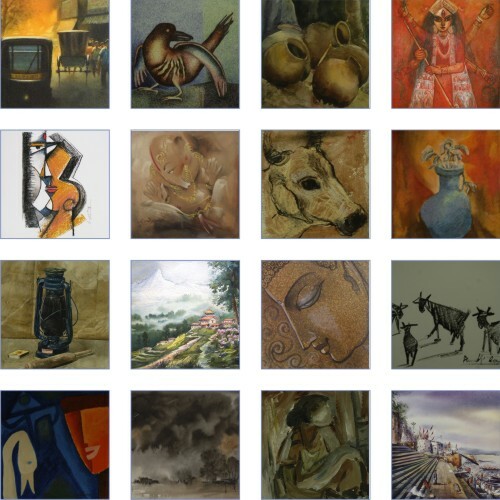 Your reasons and needs to buy a painting are varied, and so is our collection of paintings at India Art Village. Choose from India’s largest collection of over 1500 paintings, from over 150 artists! Browse for paintings on a variety of Themes, Surfaces and Artists …we are sure you will find something to fall in love with. Indian artists are getting their share of fame and famous Indian paintings are selling for unbelievable prices. On a less commercial note, people are increasingly looking Age Must Not Wither ThemArt and paintings in particular to enhance their décor or to make a statement about who they are or what they like. Whether you buy art for love of paintings or as an investment, i.e. whether your motivation is love or money, you need to look after these valuable pieces. He truly is gana+pati … the ruler of multitudes. With his elephant head and his protruding belly. He is the best known and most widely worshipped God of the Hindu pantheon. He is also the most popular God represented in Indian paintings, both ancient and contemporary. He is the remover of obstacles, the lord of learning and letters and his love for modak (a yummy sweet meat comprising a rice pastry stuffed with coconut and jaggery)…what’s not to love?! This non- sectarian God is depicted in so many different forms crawling as a baby, standing, seated, reading a book, writing, dancing, playing musical instruments, reclining – the representations of this god are innumerable. And artists down the ages – painters, sculptors, muralists have chosen their own unique interpretations to depict this lovable diety. http://www.IndiaArtVillage.com has a novel collection of artworks depicting Ganesh that are attractive and won’t pinch your pocket. Browse our gallery of Ganeshas and choose your favourite! India has a rich tradition of tribal, religious and folk art, artists in India in the early years of the last century followed western traditions of painting realistic landscapes and portraits. Artists like Raja Ravi Verma and Vasudeo Pandya. It was a group of artists, ‘Progressive Artists’ Group’, in the 1940’s-50’s comprising FN Souza, SH Raza, MF Husain, and VS Gaitonde, among others who consciously worked to create an art tradition reflective of avant-garde India and the modern times. In the east, Abanindranath Tagore took up the cause of establishing and supporting ‘Indian Paintings’ inspired by the Mughal and Rajput styles of art. Beginning from here and slowly picking up in momentum, the perception of change has widened today to include anything from pretty pictures to the latest developments in the west, which concentrate a lot on installations and proactive art. Indian art has arrived on the very fringes of international consciousness. The talent and history of Indian art is a reality, but it has not even touched the levels of more oriental appreciation (as in East Asian, e.g. Chinese, Indonesian, etc.). Internet has the ability to reach out to a wider audience, across India and the world. It’s becoming the preferred medium to acquire and disseminate information to the world and could definitely promote the cause of Indian art. India Art Village has a new look! We are happy to launch our new website. We hope you will enjoy our work of labour & share your feedback with us! India Art Village has a new logo! Hi, We are unveiling our new logo today….. We have infused it with new hues & also emphasised our mission, which is to ‘Making Art Affordable’.